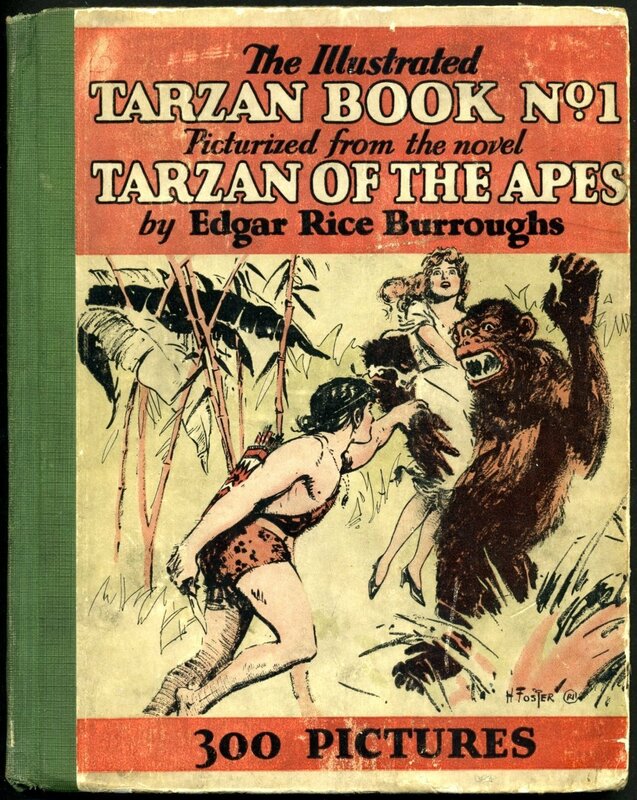 In 1928, Joseph H. Neebe contracted with Edgar Rice Burroughs to produce a comic strip based on TARZAN OF THE APES. Mr. Neebe formed a new syndicate, Famous Books and Plays, Inc., and attempted to obtain the talents of J. Allen St. John to illustrate the strip. Mr. St. John was interested, but when he learned that a deadline had been set for the completion of the strips first episodes, he turned the job down, feeling he could not offer his best under the circumstances. 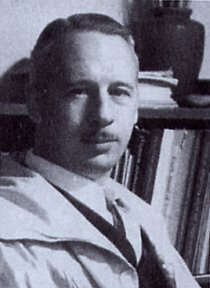 Neebe hired Harold Foster to produce TARZAN OF THE APES in strip form. Neebe then contacted Maximilian Elser, Jr., of The Metropolitan Newspaper Service and arranged for distribution of the strip and a new company was formed. 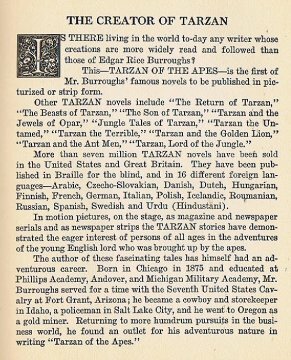 The Metropolitan Newspaper Service and Famous Books and Plays, Inc. Out of this arrangement a new publishing company was formed, Metropolitan Books, Inc., whose first book was TARZAN AND THE LOST EMPIRE in 1929. In January 1929 the first TARZAN strip was published in 13 American and two Canadian outlets (Toronto Star and Halifax Chronicle). It was not a "comic strip" . . . it was a story strip. 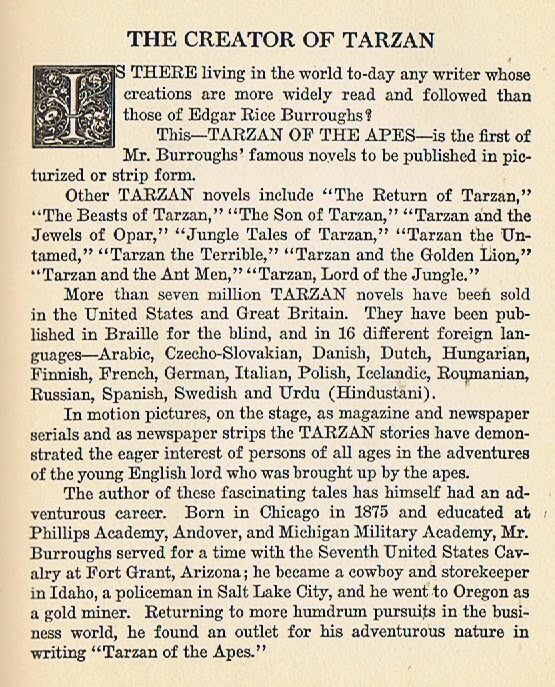 The novel, TARZAN OF THE APES, had been abridged and illustrated. Each strip consisted of five illustrations with the abridged text printed beneath each illustration. 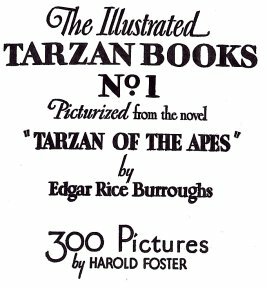 TARZAN OF THE APES was published in 60 daily episodes covering a 10 week period and was sold on the basis that newspapers buying it might drop it after ten weeks or continue it if readers showed interest. 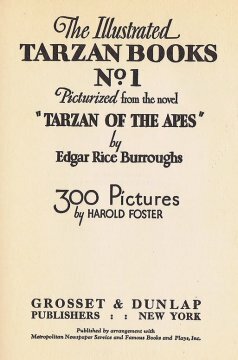 Needless to say, the combination of ERB's most famous character and the illustrations of Harold Foster made Tarzan successful in still another medium. January 7, 1929 is given as the release date for the first strip but the strips were not dated, they were numbered, enabling newspapers to start the feature from the beginning even as late as the mid-thirties. 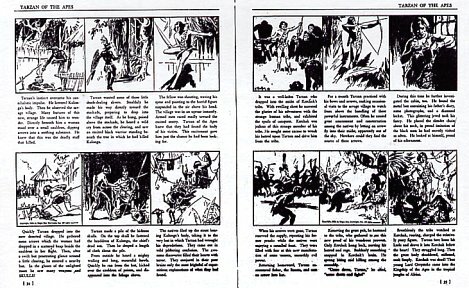 For papers starting the feature with the then current episodes, a six-episode condensation of Hal Foster's TARZAN OF THE APES strip was available to be used as an introductory feature. 24. Tarzan's Tragedy 1608 31. In the summer of 1929 Grosset & Dunlap published the first TARZAN story-strip in book form. It contained all 300 of the illustrations by Harold Foster which had appeared in the strip plus an additional illustration which Foster prepared especially for the book. It appears on both the cover and the dust jacket. This book was intended to be the first of a series of illustrated Tarzan books. 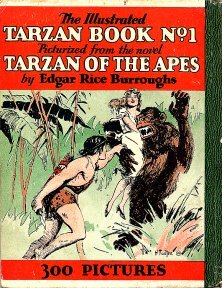 G&D published it in the same format that Cupples & Leon was using to publish their popular series of LITTLE ORPHAN ANNIE cartoon strips in book form, but THE ILLUSTRATED TARZAN BOOK NO. 1 had no sequels. The reason for this, according to a letter from G&D in the 1940s, was because TARZAN #1 was not successful. The additional illustration, used on the cover and dust jacket, visualizes the tales from one of the strips, "Terkoz turned to fight for his prize." The full title of this book is even longer than TARZAN AND THE TARZAN TWINS etc. Reprinted in 1934, the new printing did not have a dust jacket and printed the Foster cover illustration on both the front and back board covers. The cloth reinforced spine was replaced by a green paper spine and the price, 25 cents, is encircled on the front cover. The book consists of 76 pages with four of the illustrations dropped, one each which appeared on pages 76 through 79 of the first printing. Although the blurb on the cover claims 300 pictures it contains only 296. . The TARZAN OF THE APES story-strip illustrated by Foster was reprinted in COMICS ON PARADE, Vol. 1, No. 1, April 1938 through Vol. 1, No. 7, October 1938. The magazine was published by United Features Syndicate, Inc., who had taken over the TARZAN story-strip distribution rights in 1930. 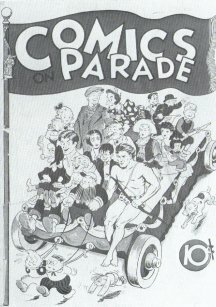 The magazine sold for 10 cents per copy and reprinted the strip in color. 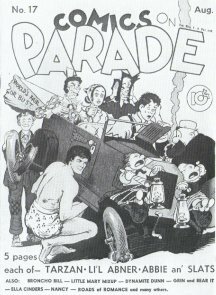 None of the covers featured TARZAN but he appeared with groups of the other characters featured in the magazine on several covers. One of the better of these, by Paul F. Berdanier, appears above. 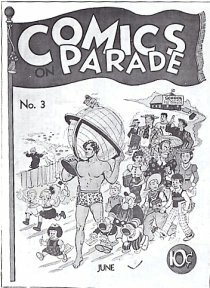 A collection of COMICS ON PARADE, NO. 1 through 12, containing the Foster story-strip, were bound in illustrated boards and reissued at the New York World's Fair in 1939-40 and sold through the mail in 1940 at $2.00 per volume. 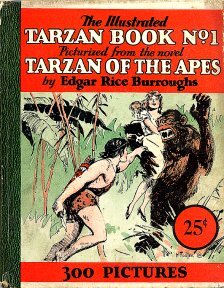 TARZAN OF THE APES by Edgar Rice Burroughs. Large Feature Comic No. 5. Dell Publishing Co. New York. 1938. Illustrated by Harold Foster and Henry E. Vallely. Paper covers. 8-1/2 x 11-3/8". 72 pages. 10 cents. This large size volume was one of the first of Dell's "comic book" line. It reprinted the 60 story-strips by Hal Foster, one strip per page, with each page containing an additional illustration by Henry E. Vallely. In addition to these, Vallely also did 10 full-page chapter drawings, making a total of 70 new illustrations for this edition of TARZAN OF THE APES. The new chapter titles are 1. Marooned in the Jungle 2. At Home in the Jungle 3. A Captive of the Apes 4. Tarzan Victorious 5. Tarzan on the Trail! 6. Tarzan Finds His People 7. Terror Strikes 8. Tarzan to the Rescue 9. Back to Life 10. 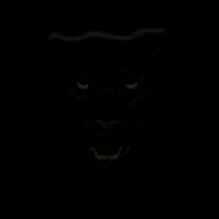 The Secret Disclosed. 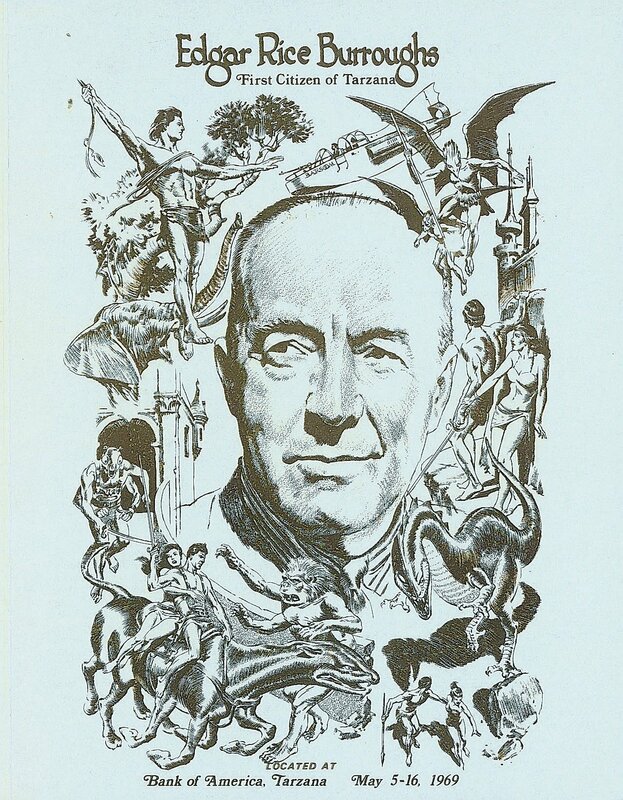 Edgar Rice Burroughs was an adventurer in life before he opened up new worlds of adventure with his books. The creator of Tarzan, John Carter, Barney Custer, Billy Byrne (The Mucker) and other notable fiction characters was born in Chicago, educated in private schools and at Andover, Massachusetts, and finished his education with four years at a famous military academy. 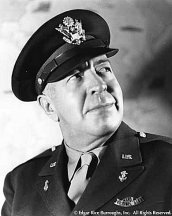 Soon after leaving the academy he enlisted in the 7th United States Cavalry, and saw some active service in Southern Arizona. It was while in the cavalry that he acquired the love for horses that has never left him. 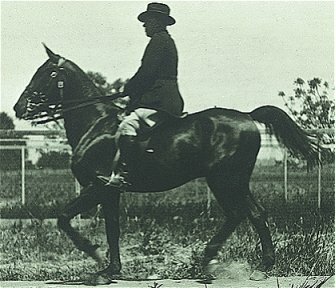 Incidentally, he is a rough rider of the first class, winning fame in his western days as a master of bad horses. He went on to become a policeman in Salt Lake City, a cowboy in Idaho, and a gold miner in Oregon, but he did not start to write until he was thirty-five. He always had an idea, however, that he could write and son one day he decided to write a story. 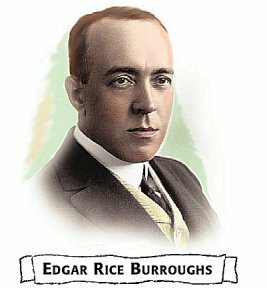 Action is characteristic of Edgar Rice Burroughs so Tarzan of the Apes was written. 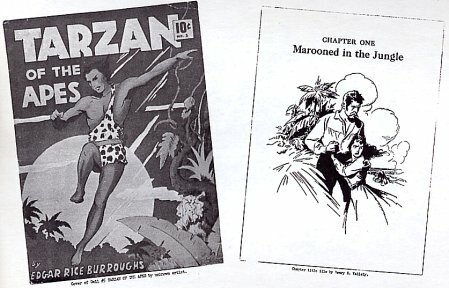 Tarzan was an odd story, written at odd times on odd pieces of paper. It was sent to a magazine and instantly became a big success. Mr. Burroughs became famous and since that time the world has been fairly clamoring for more stories from his pen. 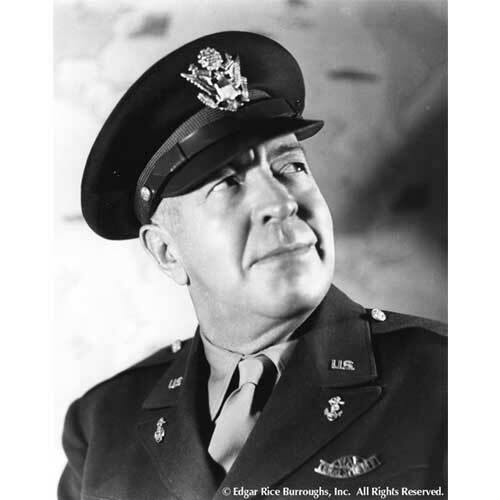 During the first World War, Burroughs served as a Major with the Illinois Militia. 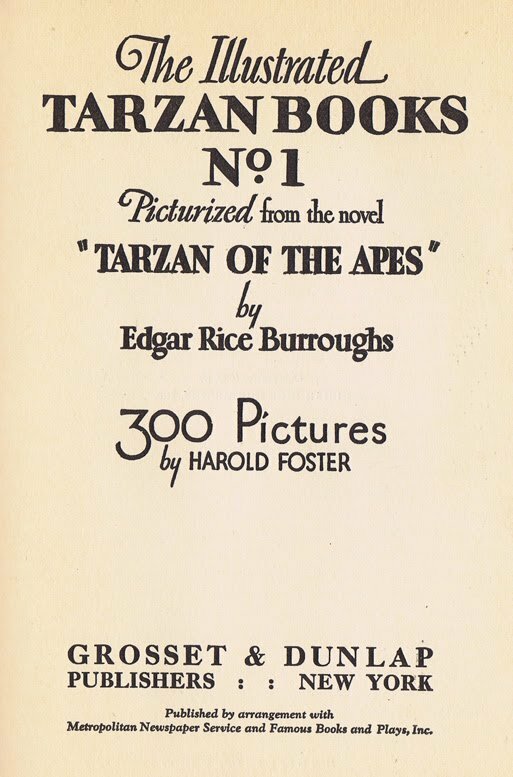 The film version of Tarzan of the Apes, in 1918, was one of the first films to make more than a million dollars for its producers, and Burroughs owned stock in the film. He was one of the first authors to successfully publish his own books. At age 58, he became interested in aviation and obtained his pilot's license. After witnessing the bombing of Pearl Harbor, he became perhaps the oldest war correspondent covering the bombing of the South Pacific and was an actual participant on at least one bombing mission. He died in 1950 in his 74th year, but his "deathless prose" lives on and has made him one of the most popular and widely read authors in the world.